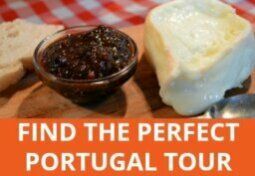 As you’ll see from this article, Lisbon is fun to visit at any time of year but there’s always a chance of rain during the cooler months. 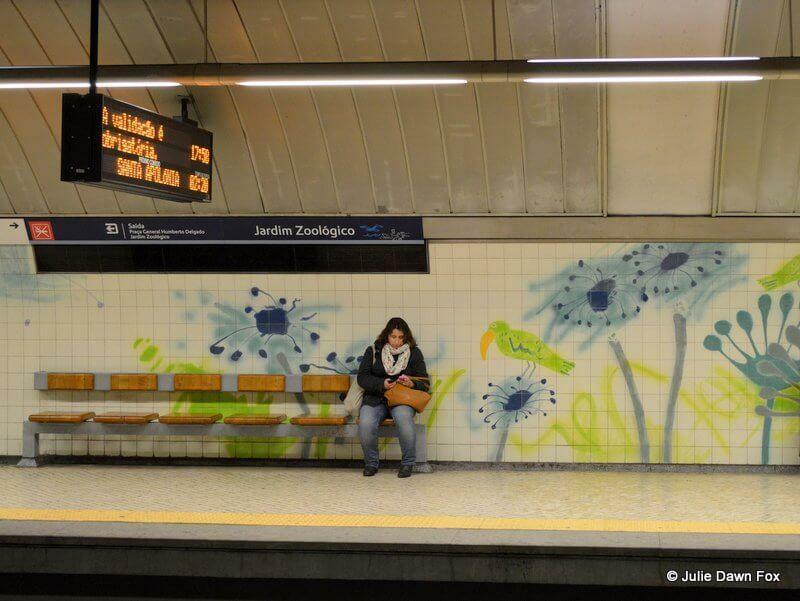 If you’re wondering what to do in Lisbon when the weather’s not so great, get yourself a metro ticket and check out the city’s extensive network of metro art. 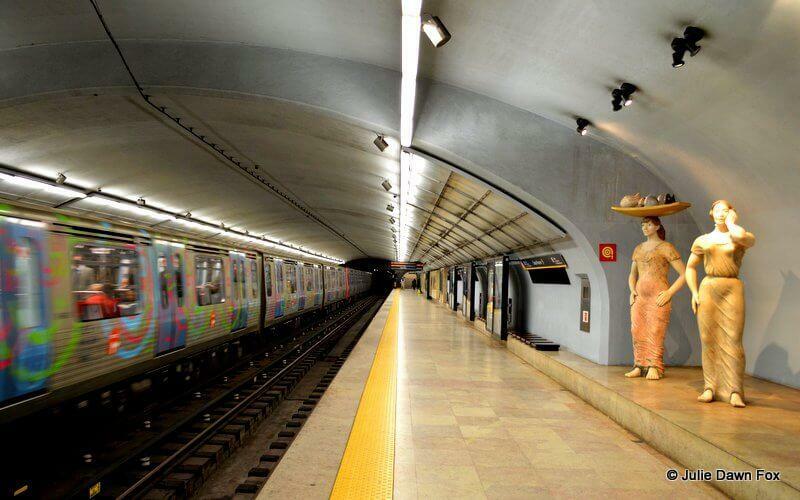 Artist Maria Keil began decorating the city’s underground train stations in 1957 and over the following 25 years, she had completed 19 stations. 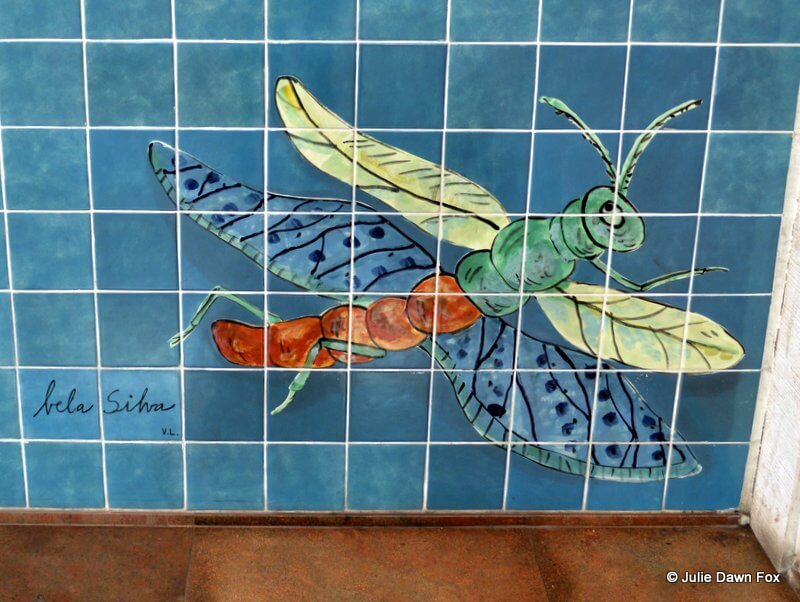 Her work revived enthusiasm for azulejos and sparked a new wave of creativity with painted tiles. 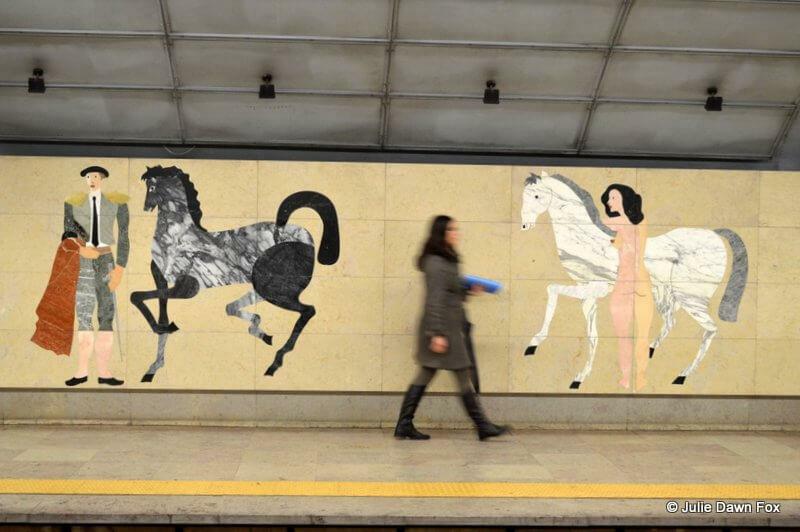 With each extension of the network, other artists have contributed their style and imagination to Lisbon’s metro stations, creating an impressive underground metro art gallery. Like many visitors, I had noticed the art at various stations but never paid much attention to it. 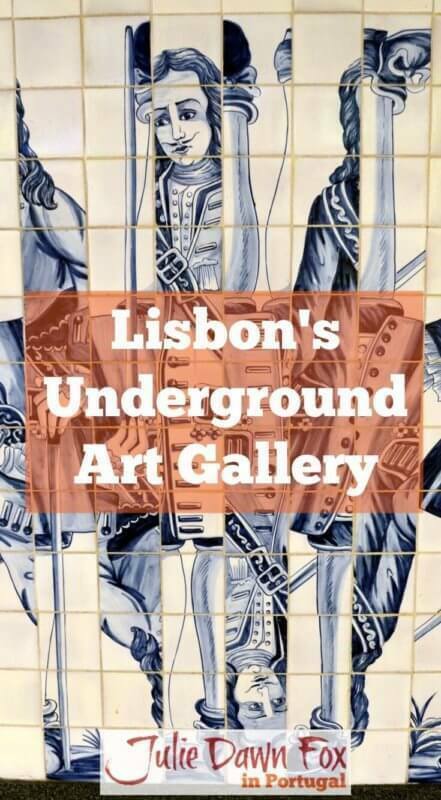 When I spotted the Underground Art Route among my trusty pack of Lisbon Walks Cards, it seemed the perfect way of brightening up a dreary day, especially as I’d forgotten to bring my umbrella. I did a little research and added a few extra stations to the suggested route but decided to save Oriente and the red line for another day. I remembered seeing some knights with shields and horses at Martim Moniz station so I started with the green line. I was expecting to find artwork at all of the stations but I had to wait another 7 stops for the next one that looked interesting. The red tiles, manic monkeys and lovely ladies decorating the walls at Alvalade were worth the wait though. Next stop was Campo Grande, where I swapped to the yellow line. 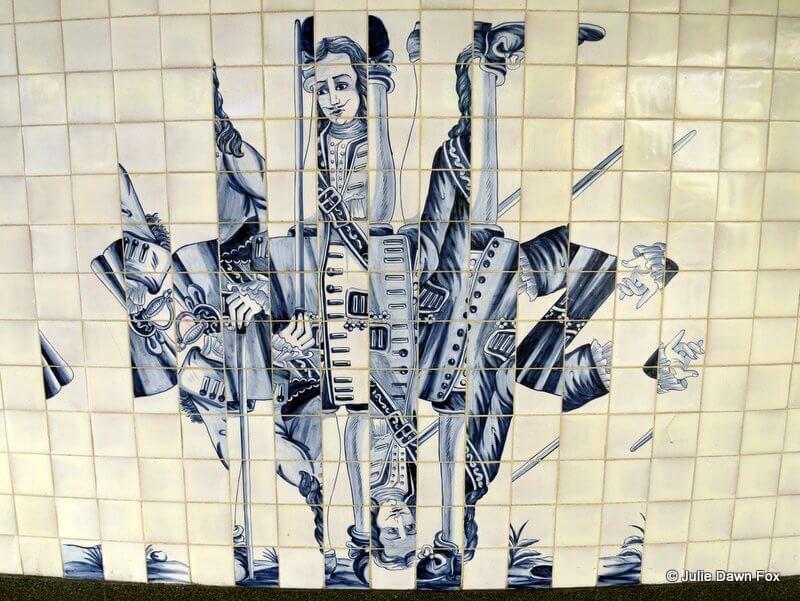 I loved Eduardo Nery’s jumbled compositions of traditional 18th century azulejo figures. Cidade Universitária station was predictably influenced by books and learning and whilst it was interesting, it wasn’t one of my favourites. I much preferred Entre Campos which has a line of women on each platform with baskets on their heads. I really liked Campo Pequeno‘s metro art with the clever use of inlaid coloured marble to create images of bulls, bullfighters, horses and naked ladies. Saldanha was the first stop I made from the Lisbon Walks card. Each bench along the platforms is decorated with painted tiles and touches of gold that depict the five senses, natural elements, seasons and emotions. I didn’t like the look of Picoas station and was running short of time so I stayed on the train until I got to Marquês de Pombal. It’s named after the man responsible for rebuilding Lisbon after the massive earthquake that destroyed the city in 1755. On same floor as the ticket gates, the walls are painted with scenes from 18th century life before, during and after the disaster. I changed to the blue line and stopped at Parque, which is devoted to the Portuguese discoveries and has some pictures of terrifying creatures as well as maps and the names of famous explorers. There’s so much to see here that I missed a couple of trains while I was examining the walls and getting a weird and wonderful history lesson. I’ve been to the Jardim Zoológico station several times but again, hadn’t stopped to appreciate the animals and plants that roam its walls. It took the artist, Júlio Resende, two years to complete the paint job but the results are lovely. My absolute favourite piece of metro art (so far) is a panel called “The Arrival” at Restauradores. It was commissioned to honour the Brazilian president’s visit for the 500th anniversary of the ‘discovery’ of Brazil in 2000. I love the bright colours and the cheeky devil. That was all I had time for during this visit but I know what I’ll be doing next time I’m in Lisbon on a rainy day as I still want to go to Laranjeiras and several stations on the red line. If you don’t leave any of the stations (i.e. swipe your ticket to get out), you can ride the metro and visit several stations for the price of a single fare. 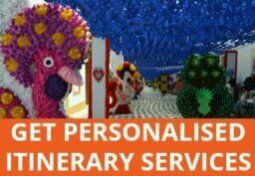 If you have a Lisbon Card, it includes unlimited rides on the city’s public transport system. 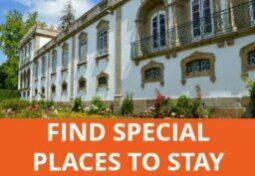 If you haven’t sorted out your accommodation in Lisbon, read my post about which Lisbon neighbourhoods make the best bases. Goodness, never knew there were so many works of art in the Lisbon underground, I just remember the one at Laranjeiras (orange trees) with the tiled oranges. 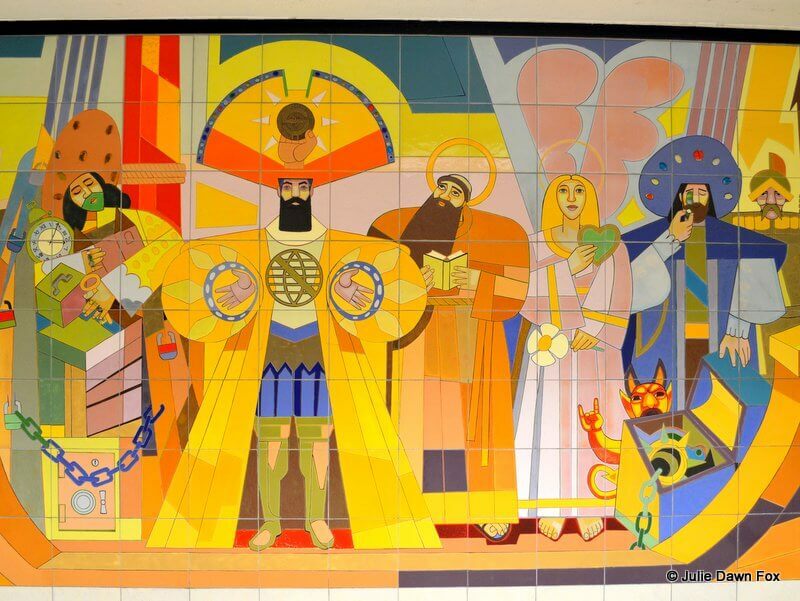 We had an apartment near Campo Grande when my daughter was studying in Lisbon, but I can’t remember seeing that mural by Eduardo Nery either, unless it was done in the last 6 years since we have been in Australia. 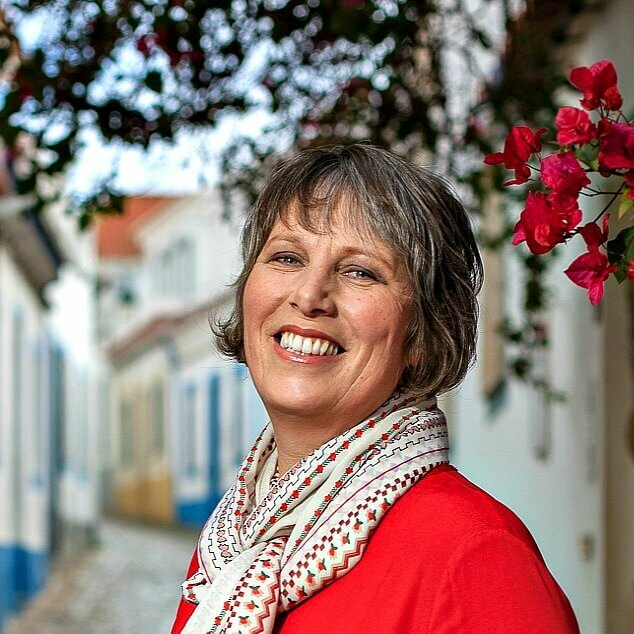 I supposed I didn’t look at things with a blogger’s eye then… We are planning our next trip to Portugal, so I will keep an eye on the underground works of art. Thanks Julie. Hi Sami, I’m not sure when the murals in Campo Grande went up – they look older than 6 years but I haven’t checked. It’s all too easy to walk straight past things when they’re part of your everyday life so it’ll be interesting to see what else you notice with your fresh bloggers eyes during your next visit. A great piece. Thanks. I wonder what the art is like at the newest metro station – the Airport.